Boquete's Cloud Forest has it all! 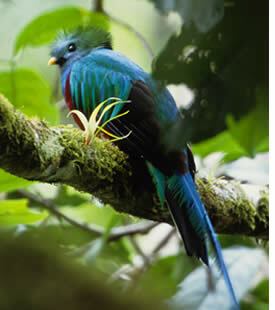 Quetzals, Volcanoes, Waterfalls, Wildlife, Panoramic Views! 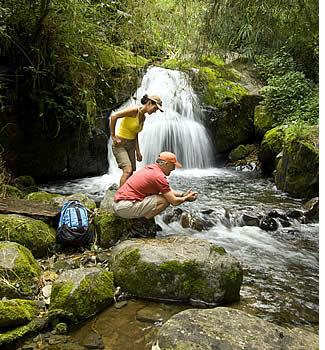 Go here for more info about hiking the Volcan Baru and here for hiking the Quetzals' Trail. Please note: most hiking trails in Panama are not maintained nor properly signed posted. Visitors not familiar with the area should always hike with a certified guide from a reputable company, as getting lost in the rainforest can put your life in danger. Sudden river surges, precipices, cold nights and other hazards are real threats. Wherever you're: never hike alone. * Please note: most hiking trails in Panama are not maintained nor properly signed posted. Visitors not familiar with the area should always hike with a certified guide from a reputable company, as getting lost in the rainforest can put your life in danger. Sudden river surges, precipices, cold nights and other hazards are real threats. Wherever you're: never hike alone. This trail is located in the Bajo Mono area within private land owned by the Landau family, one of Boquete's founding families. This White Rock trail provides you with very good chances to spot a Resplendent Quetzal, sloths, howler monkeys as well as many other birds and wildlife. This is one of the easiest hikes in Boquete as it is virtually flat so it's not only a great choice if you're priority is to get up and close with the wildlife, but it's also suitable for families with kids or those looking for a less strenuous hike. Most of the hike is through Boquete's cloud forest though at the beginning you'll go through several vegetable plantations. At the end of the trail you'll reach a small waterfall which gives this trail its name: at the top of the waterfall there are many white rocks! This hike, even though it's short, it's more challenging than the rest of the half day hikes as it is quite steep! You start at about 1300 meters above sea level and end at about 1800 meters reaching a beautiful platform known as Lino Rock which gives you one of the most stunning views of the valley of Boquete (you can also rappel down this rock). Most of the hike is through a typical coffee plantation (Boquete is famous for its coffee), and just the very last bit of it is through cloud forest. A must do if you want to appreciate the best view of the town of Boquete (perfect photo opportunities) or if you want to test yourself for more strenuous and longer hikes. Another short but very rewarding hike that takes you through farmland, cloud forest and finally leads you to a quite impressive volcanic rock formation (under which there is also a small cave) from where you can enjoy a clear view of the Pacific Ocean and the Volcan Baru. Some say that this hike offers the best view of all of Boquete's hikes and we won't deny this claim. Many tales surround this site as it was supposedly used to store weapons by the local indigenous troops. This trail is located in the eastern part of Boquete's valley at approximately 1700 meters above sea level in an area known as Alto Jaramillo. Definitively one of the hikes that you cannot miss! 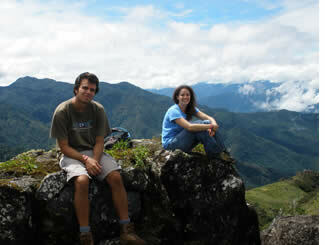 La Novia de la Montaña is a short hike in the northern area of Boquete, in the Horqueta region. This secret trail, which is moderate on our scale of difficulty (the change in altitude is only 200 meters but some passages can be quite steep), is an adventure that offers a little bit of everything. 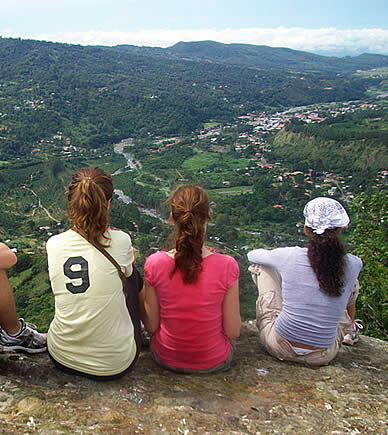 It starts with beautiful panoramic views of the mountains and fincas surrounding Boquete. Later on, the path will lead you through an open space with trees on both sides, making it ideal for bird watchers, and the famous and elusive Quetzal can be spotted quite often. Other bird species include pinzones, tángaras, colibrís, ruiseñores, trogones, tucancillos, víreos, carpinteros, without to mention mammals that are typical of this area, such as the 2-finger sloth, the howler monkey, the capuchin monkey, and the ardilla cola roja, amongst others. Once you enter the cloud forest, you have the opportunity to see immense trees that date back hundreds of years, and a variety of flora, from unique Panamanian flowers and orchids to plants that are used to treat cancer. Some of the tree species include sangrillos, jaules, laureles, robles, mamecillos, pinos, cipreces, guarumos and a grand variety of plants including piperaceas, bromelias, orchids, helechos, heliconias, etc. Be sure to bring good hiking shoes (or we can lend you some boots) because you're going to get dirty! The forest is humid and muddy, and in some areas the path gets very steep, which makes it more difficult than other hikes in Boquete. And bring your swimming suit if you dare! At the end of the hike you'll reach a waterfall about 15 meters high. We call it "the lady of the mountain" because you can see the face of a woman in the rocks - some say you can see many faces. There is even an ancient ceremonial altar in front of the waterfall that makes you feel you're in a sacred place with a mysterious history. It is a tradition that anyone who makes the hike should go for a swim in the waterfall's pool. The water is cold, we will not lie to you, but it's definitely worth it and guaranteed to make you feel alive! 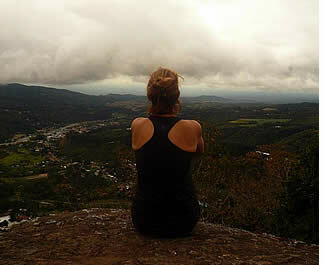 The Pianista Trail Hike is one of the most overlooked excursions in Boquete. The main reason is because it's not marked well for tourists, though someone made some orange spray-painted markers on rocks and trees (not all that easily visible, though). Please do not enter trail without a guide! The trail is located in the Arco Iris section of Boquete, in between Alto Lino and Palo Alto. The trailhead begins at the Il Pianista restaurant (which is a great place to stop for a bite to eat after your hike!). It very easy to get there by taxi (around $3/person) or bus (Arco Iris bus, about $0.75). The trail can be broken into three "sections". In the first 45 minutes, you'll walk through open area pasture land with gorgeous views of the surrounding mountains and downtown Boquete. Second you enter a dense jungle surrounded by lush vegetation, birds and insects. In here you'll walk for about 1.5 hours and enter the cloud forest where it is very humid and magical, as you're literally walking in the clouds! Finally after another 30 minutes climbing the mountain, you'll reach the top and will be fully enveloped in the cloud forest. It's really an amazing experience! Believe it or not, this trail actually goes all the way to Bocas del Toro and crosses the "Continental Divide" (on one side of the mountain the water flows to the Pacific, on the other side of the mountain the water flows to the Caribbean). The entire hike from Boquete to Bocas del Toro would take 3 - 6 days depending on the time of the year and hikers' condition. NOTE: This is a medium difficulty hike and is only recommended for children for the part up until the path enters the jungle. This trail is very muddy during the rainy season (April - December) and the weather changes abruptly, so please go prepared to get wet. Parque Internacional La Amistad is an UNESCO World Heritage Site shared between Panama and Costa Rica. The park's plant and animal life are among the most diverse of the country. The forests vary from lowland tropical to subalpine, and much of the vegetation is virgin. Five of the six species of Central American felines (the jaguar, puma, ocelot, jaguarundi, and margay) are still present here, as well as the also-endangered Baird's tapir. Only 3% of the PILA is located within the province of Chiriqui, but this part of the park is the most easily accessed of all (from the highlands of Cerro Punta). From the ranger station a series of trails depart and you'll hike two of them in this hiking trip. You'll start hiking Sendero El Retoño, an easy going 2 km loop trail full of natural beauty and simply great for bird watching. Mostly flat, this hike takes you through lush cloud forest, over small bridges spanning rushing streams and into a tunnel formed from leaning stands of bamboo. 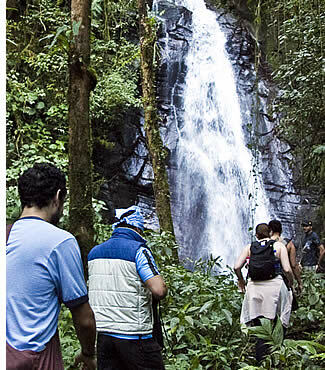 After hiking El Retoño trail, you'll tackle La Cascada trail, a 4 km hike that leads you to a ridge with views of the valley and a spectacular waterfall. 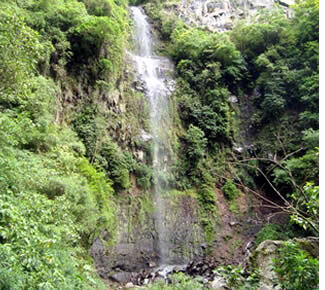 It's about a 2 km uphill hike to the waterfall, with an ascent of about 300 meters (starting at 2,180 m). Through the trail you'll encounter three "miradores" (observation platforms) with sweeping views of the mountains and valleys. Those in for more of a challenge can return a bit and then continue through another trail for another couple of hours from where you can see the Caribbean on a clear day. Considered one of the most gorgeous paths in Central America, the Quetzals Trail is without any doubt the most popular hike in Panama's western highlands. 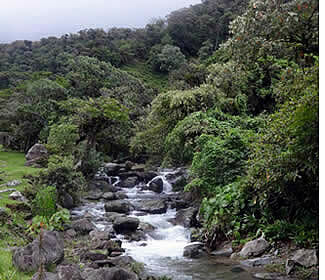 Located within the Volcan Baru National Park, the "Sendero de los Quetzales" links the towns of Guadalupe, which is near Cerro Punta on the west side of the Volcano, with the town of Boquete which is on its east. The trail skirts the Baru Volcano on its north face and can be hiked in any direction, starting in Boquete and ending in Cerro Punta, or vice versa. This hiking trail has been used for centuries to go to Bocas del Toro but nowadays it's certainly more challenging as the trail isn't maintained anymore because taking the bus or driving over the Cordillera is a lot more popular! It can take you anything from 5 - 7 days to hike this trail and should only be attempted during the dry season (December - April). During the rest of the year, depending on how much it has rained, you can hike up to the continental divide but it will be extremely muddy and difficult. You'll get to experience the cloud forest at its best, with plenty of wildlife, birds and plants... a naturalist's dream! At 3,475 meters (11,400 feet), "el Volcan Baru" is the highest point of Panama. The hike to the top is a total of 13.5 km from the ranger station and can be completed in a single day or also by camping. This dormant volcano is just south of the Continental Divide in the western province of Chiriqui. The towns of Volcan, Cerro Punta and Guadalupe can be found on its western side, while Boquete is on the eastern flank. The fertile volcanic soil and climate of the area make it one of Panama's most productive agricultural regions as it is also drained by the Chiriqui and Caldera Rivers. Unfortunately no Boquete maps exist with reliable and complete information about Boquete's hiking trails. For starters, heavy rains sometimes leave certain hiking trails inaccessible, even for years. On the other hand many hiking trails are located within private property, and even though by law, access to waterfalls and mountain's peaks should always be granted, it is not always the case... we're working on it! We have the perfect trail for you... Contact us!